For a while I’ve been hinting at a warm weather winter vacation for my wife and me. We finally got the plans finalized and over the weekend I posted a few teasers on the ValueTactics Facebook page. 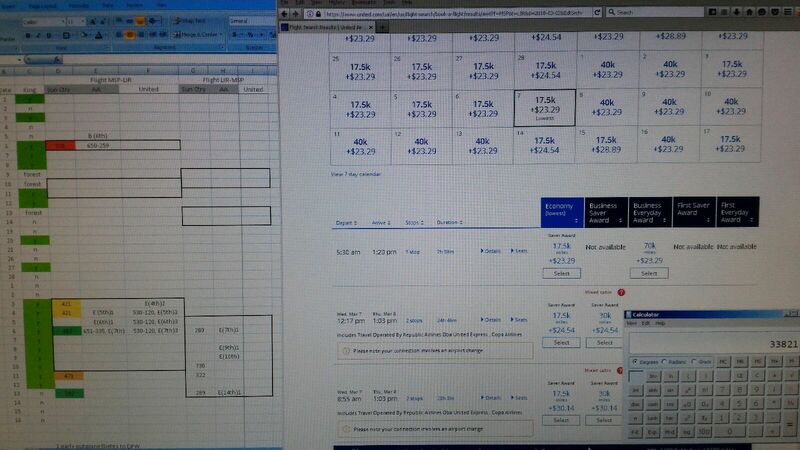 I showed a few screenshots of our online bookings. I blurred out the locations but astute observers will notice the flights were on American Airlines and the hotel booking was at a Hyatt property. So that narrows it down to about 1,850 destinations. . . In early March, we’re returning to the site of this February’s “Long Weekend in Paradise,” the beautiful Andaz Papagayo Peninsula in tropical Costa Rica! 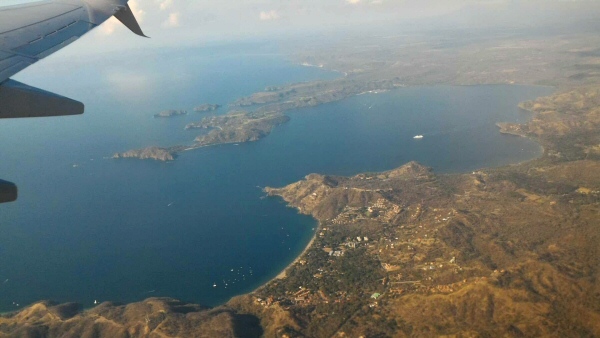 The planning for this trip was similar to the last time we stayed at the Andaz Papagayo. I can’t typically get vacation time in the spring so we’re limited to winter months. In order to get somewhere unequivocally warm in December through mid-March you have to get waaaay south. The Caribbean is a tough nut to crack when looking to redeem anniversary nights from the Chase Hyatt card. The anniversary nights are only good at a category 1-4 hotel, which are hard to come by in the Caribbean and Mexico. The eligible hotels in those regions aren’t anything special and aren’t worth the trouble of a short vacation, in our estimation. I wracked my brain looking for other options but all paths led once again to the Andaz Papagayo. This time around the planning was much harder than last time. I predicted a phenomenon that finally appears to have come to pass. With the Caribbean resort capacity severely diminished due to hurricanes, many vacationers have had to cancel or rethink their winter travel plans. Those who decided to find alternative destinations probably opted for nearby areas that weren’t hit by the storms. Those would include Jamaica, certain smaller islands, and Central America. I literally couldn’t have done it without a spreadsheet. It was like a linear programming problem! We planned our last Costa Rica vacation only a week or two earlier than this year’s planning, but this year the award night and flight availability was very slim. I was forced to make a spreadsheet just to organize it all. Eventually the puzzle pieces fell into place and we ended up with a FREE 4 night warm weather get-away! This entry was posted in American Airlines, Hyatt, My Story and tagged Andaz, Costa Rica on December 13, 2017 by Gomanson. A long weekend in paradise. . . why not? The idea for this vacation came about quite differently than most of my other trips. There was no months-long planning phase; no advanced strategy. Nicoleen and I realized in October we each had free nights on our Hyatt accounts after paying the $75 annual fees on our Chase Hyatt cards. After looking at our yearly calendar, we figured out the only time we could fit in another trip was in February. After only 2 hours of planning, all the stars aligned and we had our trip fully booked! The planning for this trip couldn’t have been easier. In a matter of 2 hours I had found outgoing and return flights that matched our desired hotel dates. Additionally, the dates spanned a weekend so we would only have to take 2 days off work. This was one of those rare free trips where everything lined up perfectly. But it wasn’t just luck; the hotel we chose generally has great award night availability, which is why we were able to book our desired dates at this in-demand property only 4 months ahead of time. Our Hyatt annual free nights were good for any category 1-4 Hyatt property. To get our money’s worth out of the $75 annual fee needed to get the free night, we needed to find a hotel stay worth more than $75 (not hard to do). Since the purpose of the trip was basically to burn our free nights, we weren’t looking to spend more than 3 or 4 nights. On the other hand, 2 free nights would be too short, so we needed at least 3 available award nights in a row. A short trip also requires short travel time, so we limited our search to North and Central America. Find the maximum optimal solution by adjusting variables while staying within constraints. Having spent a just a little bit of time researching destination hotels and resorts, I saw an obvious front runner. 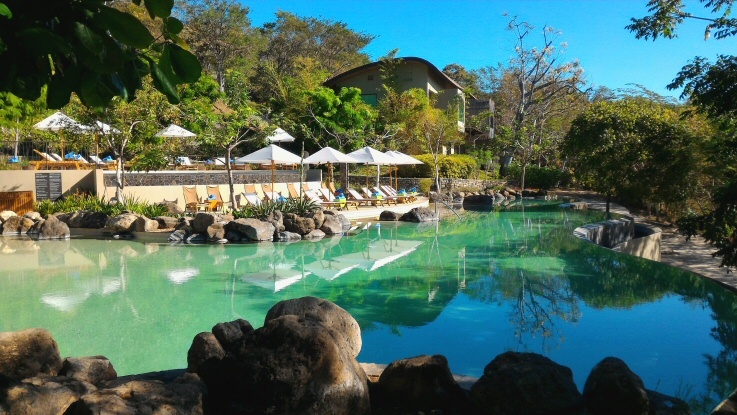 Andaz Peninsula Papagayo in the Guanacaste region of Costa Rica is a known sweet spot in the Hyatt portfolio. Fortunately for Chase Hyatt card holders, it is category 4 so it qualifies for the annual free stay. Even more surprising is that award stays cost a mere 15,000 Hyatt gold passport points! (Similar properties around the world typically cost 25,000.) The hotel receives overwhelmingly positive reviews online. What sealed the deal for us was getting the recommendation for the property from some good friends who stayed there last year. Chase Hyatt card anniversary nights and Hyatt Gold Passport award stays share the same availability. A quick search on the Andaz Papagayo website revealed a string of three nights, covering a weekend, in the middle of February. I immediately booked our two free nights, which are fully refundable so there was no risk. Someone else looking at the same dates would be less likely to book the single remaining night, which bought me some security as I arranged the rest of the details. The next step was to find some free flights. We were plumb out of Delta miles, so my first checks for award seats were United and American. It’s only a 5 hour flight so I wasn’t looking for premium class seats; economy would be just fine. For airfare my main criteria on a short trip like this is arrival and departure times at the destination. The worst timing for a 3 day trip would be to arrive late at night on the first day and then leave early in the morning on the last day. That would effectively make it a 3 night, 2 day trip. Low value warning! American Airlines had plenty of award seats available on our dates but the arrival and departure times were both horrible. There was a United Airlines return flight that left at 1:30 in the afternoon which would allow us to have a quick swim in the morning before packing up at a leisurely pace on our last day. I had to broaden my search for the outgoing flight and I found a direct flight on Sun Country that arrived in Costa Rica in the afternoon. I used Citi Thank-You points to pay for the Sun Country flight. The cash price on that flight was the cheapest I could find, and Thank-You points can be used to book travel at a 1.25x rate. As a bonus, the ticket is considered paid with cash so I was credited the regular Sun Country UFly Rewards on that flight. After securing the flights I transferred 4,000 supremely versatile Chase Ultimate Rewards to my Hyatt account to raise my balance to 15,000. The transfer was completed within seconds, and I booked the last remaining night at the Andaz. The planning went so well I felt like I was creating a beautiful work of art . . . It was everything I ever dreamed a 5 hour, budget economy flight at the back of an aging 737 would be. 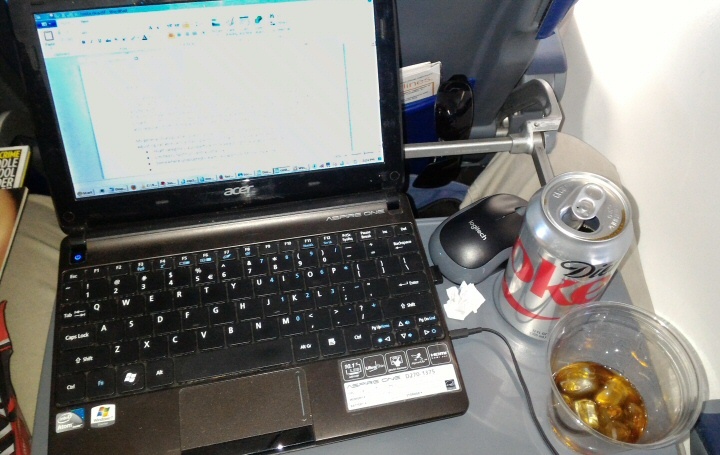 Despite being cramped, having no free food and no in-flight entertainment, I did enjoy the scenery, the company, and the opportunity to begin writing this post. The scenery: Yucatan Peninsula. 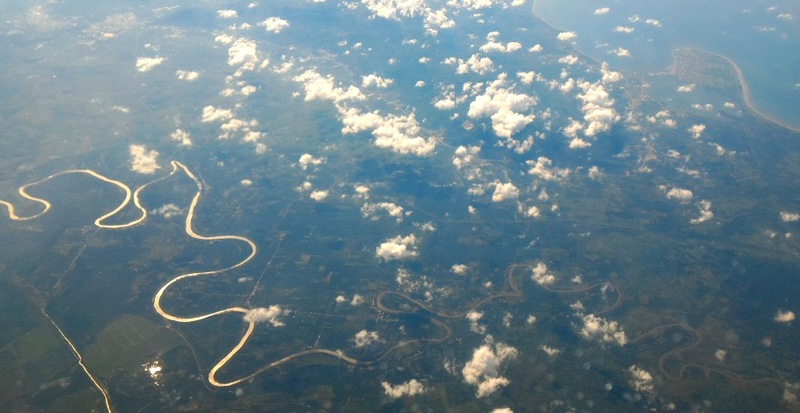 That’s one nice meander. The company: my lovely wife Nicoleen. The opportunity: My creative process at work. The Andaz Papagayo is the newest luxury resort of the very few developed properties on the Peninsula Papagayo. 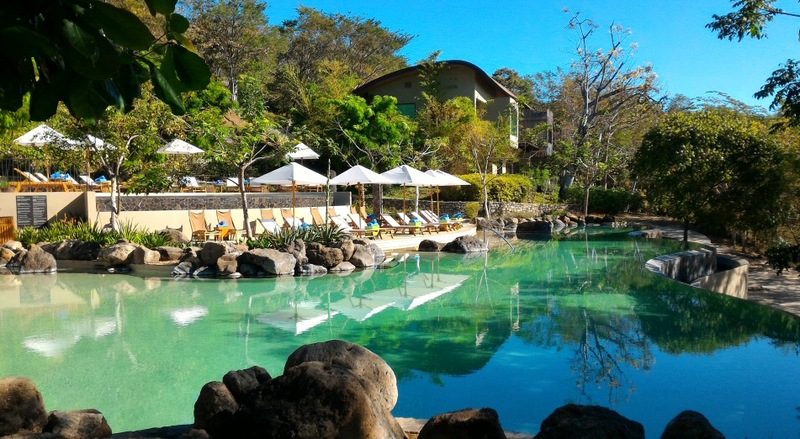 Papagayo is a sparingly-developed, forested peninsula on the Pacific side of Costa Rica. February falls in the dry season in the region, meaning the weather is uniformly hot and dry, with almost no chance of rain. It sounded like a great place to escape the cold Minnesota winter, and it was! 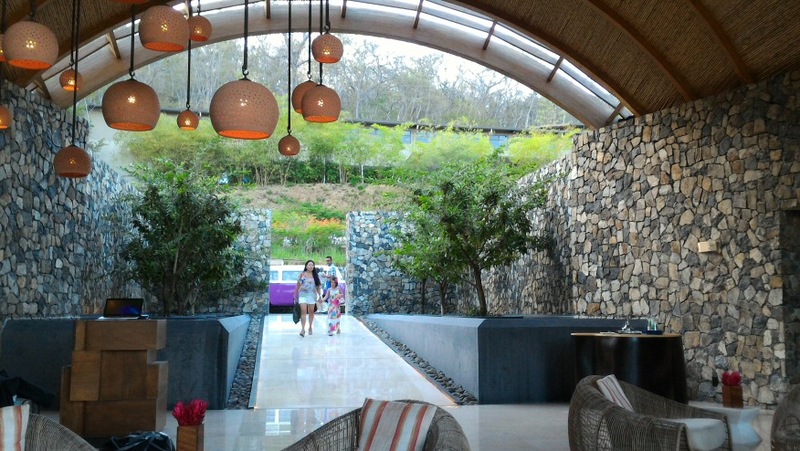 The Andaz brand vision is exemplified at their resort in Papagayo. The sleek, contemporary styling of the architecture blends beautifully into the natural surroundings. The service is courteous and friendly. The guest rooms, restaurants, and pools are interesting and unique. As I mentioned in the planning section above, the Andaz Papagayo is a magnet for value tacticians. With its high dollar to points value for award stays and its relatively low Hyatt category rating, this resort seems custom made for free stays. 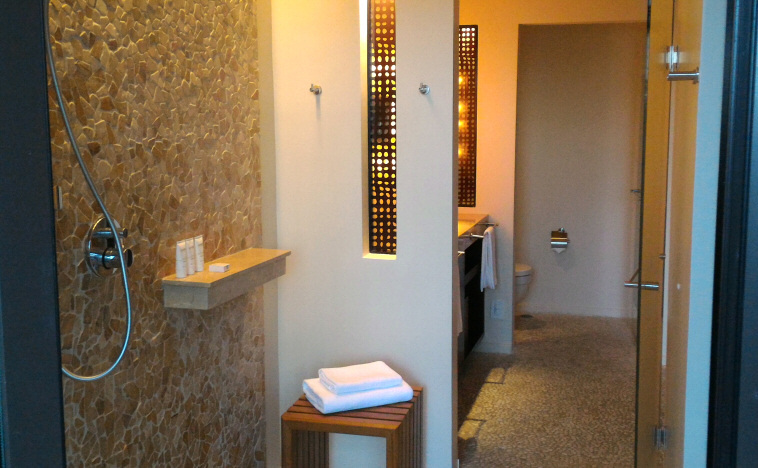 Click here to read my complete review of the Andaz Papagayo. 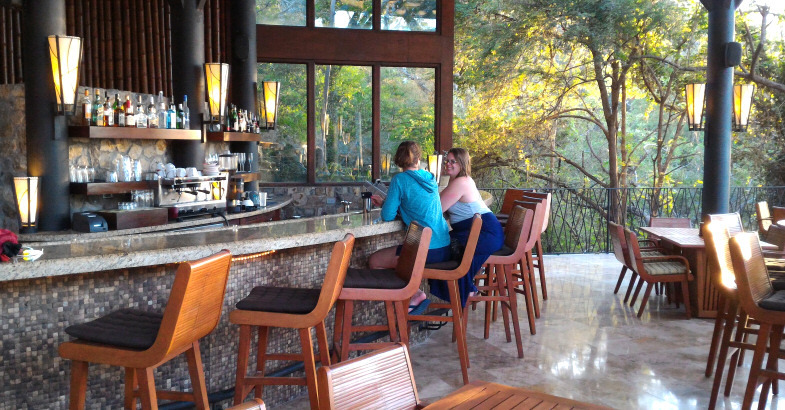 The only time we left the Andaz resort was for a short trip to the Prieta Beach Club. Access to the beach club is one of the included perks at the Andaz, and guests of the Four Seasons and several smaller properties on the peninsula are also welcome there. The Andaz provides a complimentary shuttle that goes anywhere on the Peninsula Papagayo, so we called the front desk to reserve our seats on the last shuttle before sundown. Unlike our resort, Prieta Beach Club faces the Pacific side of the peninsula so it’s the best place around to see the sunset. Nicoleen and I had some company on our little excursion. AJ and Dana were a couple from Wisconsin (Go Pack!) who had graciously helped us out with a rum shortage the day before. 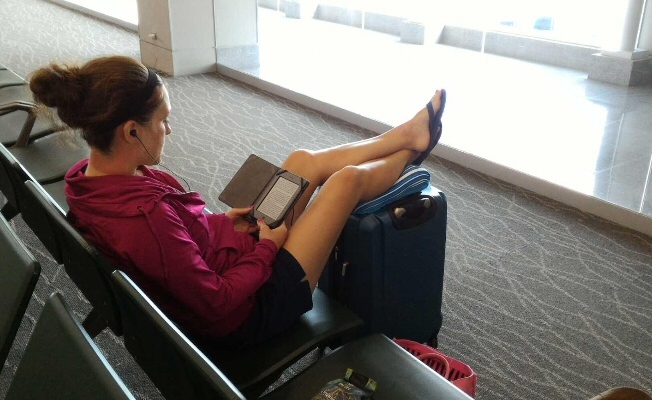 It turns out they were fellow points and miles aficionados and had booked their trip on points and miles too! Obviously this led to some good discussions and we were happy they joined us for drinks, watching the sunset and dinner at the beach club. The beach club is comprised of two restaurants, a large beach, a bar, a lap pool, fitness center, and spa. Basically it’s a hotel with no guest rooms. Only one of the two restaurants is open for each meal time: Olas for lunch and Marea for dinner. We didn’t realize this until we got there and Nicoleen had her heart set on the nachos she had seen on the lunch menu online. We ordered some beers to go with the lovely sunset, and Nicoleen kept working on the bartender for those unavailable nachos. 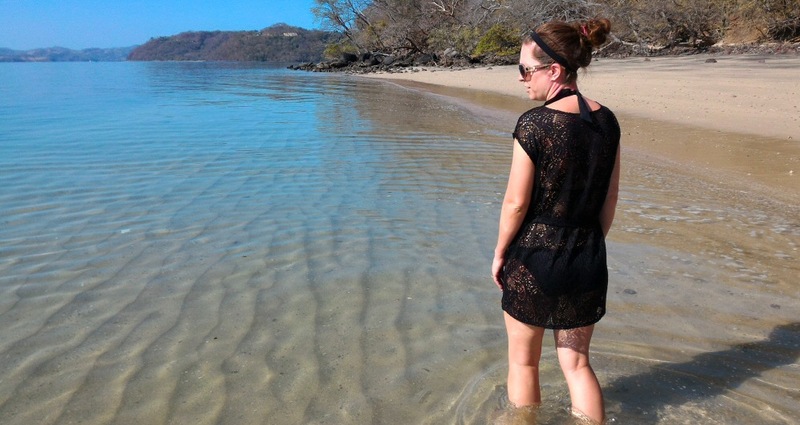 Nicoleen was shocked by the cold water of the Pacific at Prieta Beach Club, Papagayo Peninsula, Costa Rica. Ordering something not on the menu isn’t too much to ask when you’re on a free, luxury vacation, right? Apparently not! Eventually the bartender very furtively let Nicoleen know that her nachos were on their way, and seated us on a cool little island deck near the lap pool. The open air bar at Prieta Beach Club. The view from the bar at Prieta Beach Club. Both restaurants are visible: Marea on the right and Olas in the far background. The bartender seated us across the bridge on the deck in the infinity pool. Nicoleen’s pride and joy: the nachos. The nachos were exceptionally good. The servings of guacamole and pico that seemed to come with everything in Costa Rica were more than ample. After our beers and bootlegged nachos, we made the next shuttle back to the Andaz. The final day of the trip. After a quick morning walk on the beach and one last dip in the amazing swimming pools, it was time to say goodbye to the Andaz Papagayo. We packed up, checked out, and took our reserved private shuttle to the Liberia airport (LIR). Our return flight had a 3 hour layover scheduled in Houston, where we had hoped to visit the KLM lounge. We had access to the lounge with the Priority Pass Select, which is a benefit of Nicoleen’s Chase Sapphire Reserve. Everything had worked perfectly with the planning and execution of this trip . . . until now. The flight to Houston was delayed two hours due to weather. Instead of spending two more hours at the resort, we got to sit in the tiny Liberia airport and wait. Two hours turned into nearly three hours, and on the flight it became evident we would probably miss our connection to Minneapolis. Suddenly the cramped economy seats and the missed free lounge opportunity were the least of our problems. We had the last flight of the day from Houston to Minneapolis, and arriving a day late would mean a logistical nightmare for work, daycare, kids’ school transportation, airport transportation, etc. Miraculously, we managed to sprint and budge our way off the plane, through the baggage claim area, through customs, passport control, security, and a tram ride between terminals . . . all in less than 25 minutes. When I huffed onto the plane they shut the door right behind me. * Our hotel invoice was $0.00. I’m counting the $150 from our $75 annual fees paid on the Hyatt cards in order to get the two free nights. Points earned on this trip: 602 Chase Ultimate Rewards (for hotel dining and airport souvenir shopping). 4,550 Sun Country UFly points for the flights purchased with Citi Thank-You points. 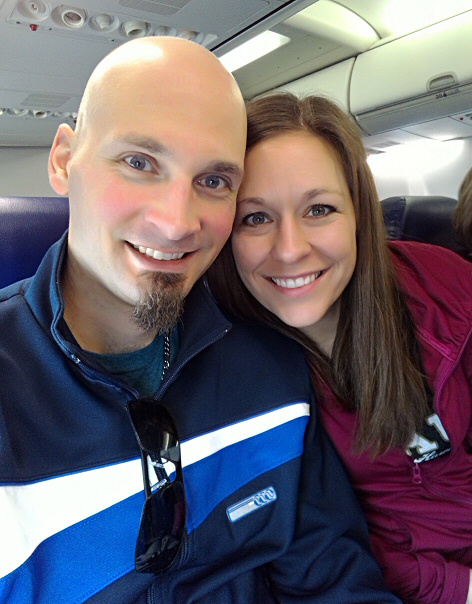 I booked the outbound flight on Sun Country airlines. Sun Country had the best arrival time in Costa Rica (afternoon), and it was also the cheapest available flight. The cash cost of the direct flight for both of us would have been $509.10. Thank-You points, which I earned with my Citi Thank-You Premier, are worth 1.25 cents each when used to book travel through the Citi travel portal. Uur outbound flight cost us 40,728 Citi Thank-You points, for a redemption value of 1.25 cents/point. That’s not the best value I’ve received with Thank-You points, but hey – it’s still free airfare! One nice little bonus when getting airfare this way is that Citi takes your points and buys the tickets. The airline sees it as a paid purchase, so you still earn the regular frequent flyer miles for the flight. This isn’t the case with regular award bookings. For the return flight I found saver level award seats on United Airlines. With taxes and fees, for the two of us it would have cost $1,016. The saver level award seats were 17.5k miles each + taxes and fees. Our cost for the return flight was 35k United miles and $121. That’s a 2.6 cent/mile redemption rate, which is pretty good. We decided not to rent a car for our short trip. Anything we would need to leave the resort for would cut into our valuable relaxation time. Therefore, the only ground transportation we needed was to and from the airport. We reserved a private van with a company called Liberia Airport Shuttle Company. Catchy, isn’t it? The cost was $59 cash per way. Everything went smoothly and the van was air conditioned and comfortable. 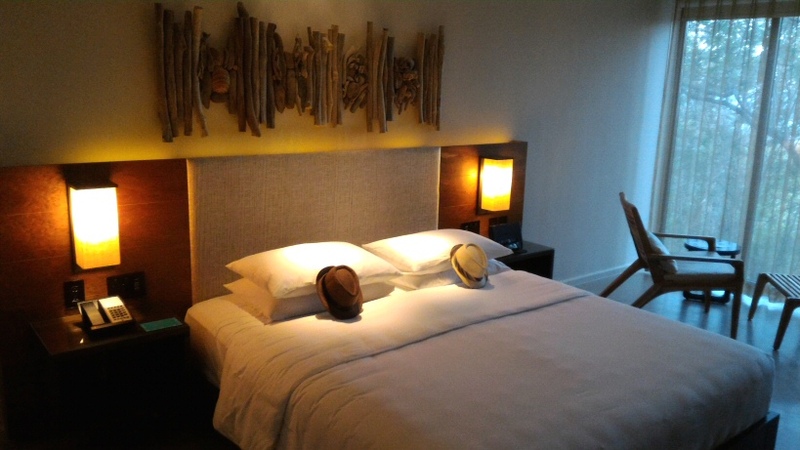 Nightly rates at the Andaz Papagayo vary drastically throughout the year. Published rates get down to around $250 during the rainy season. Around holidays and during the peak season, rates for the basic room are up around $450 a night. Then you have to add taxes and the daily resort fee. The total cash cost for our 3-night stay was $1,541 as of the day I booked our room. We used the two annual free nights we earned by paying the annual fee on our Chase Hyatt cards. I booked the third night with 15,000 Hyatt Gold Passport points, for a redemption rate around 3 cents/point. Our hotel invoice was $0.00. 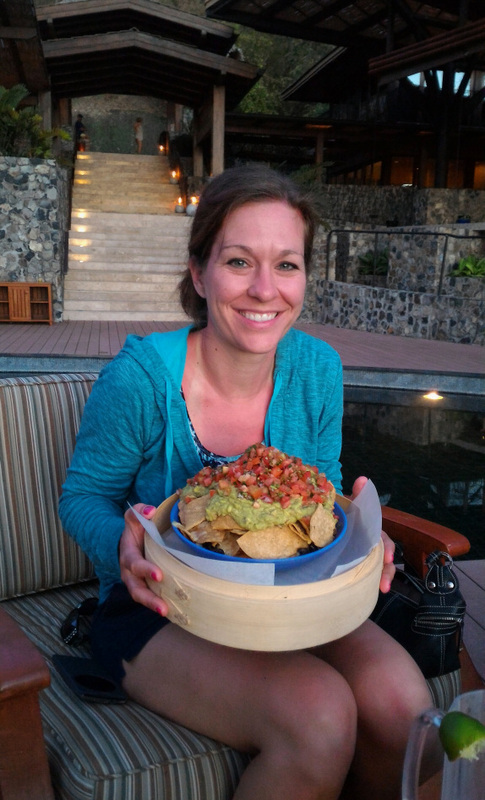 As I discuss in my Andaz Papagayo review, we brought with a small suitcase of food and drinks. It’s hard to calculate how much we saved with this tactic. I would estimate that without the ~$50 worth of food and drinks we brought with us, we would have spent an additional $150-200 on meals and another $150-200 on drinks. That’s Andaz pricing for you. As it was, we got away with only spending $190 at the hotel restaurants. Other than the food, we didn’t have many expenses. We left a few tips for the room service staff and the van drivers. At the airport on the way out we bought about $30 worth of coffee and little souvenirs for the kids. This trip started as an idea to use up our two Hyatt annual free nights. Those pesky free nights – always obligating you to plan an entire free trip around them. When you’re into value tactics, sometimes you find yourself in inconvenient situations such as this. Luckily for us, the planning went smoothly and so did the vacation. A few months ago we had zero plans for a winter trip. With a little planning effort, some points and miles, and a little bit of cash, we were able to take a refreshing long-weekend trip full of luxury in a unique destination. This entry was posted in Hyatt, Sun Country, Trip Reports, United Airlines and tagged Costa Rica, Prieta Beach Club on March 2, 2017 by Gomanson. 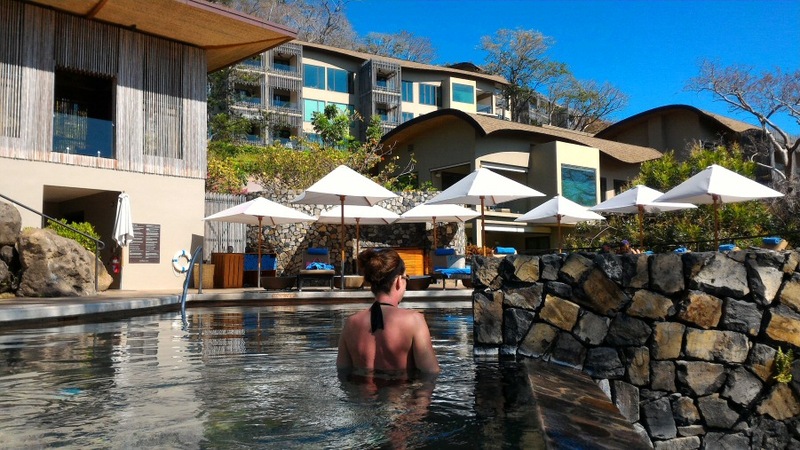 We recently spent three nights at the Andaz Papagayo Hotel & Resort in the Guanacaste region of Costa Rica. The trip was an awesome break from the Minnesota winter! Read my trip review here for details on how and why we planned this short, delightful vacation. 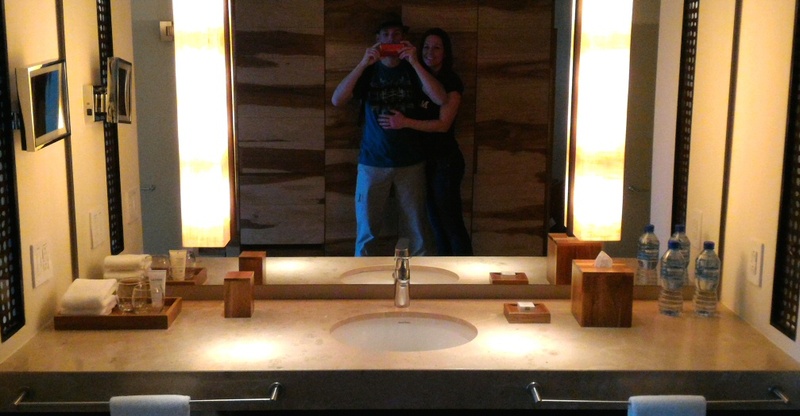 Experiencing the 90+ degree weather and the luxurious Andaz Papagayo was awesome in and of itself. Paying only $150 for a $1,541 hotel stay was even more awesome! The Andaz Papagayo opened in late 2013, which made it just over 3 years old at the time of our stay in February 2017. There are 153 rooms, 3 restaurants, multiple pools, 2 beaches, a spa, and a kids’ center. The architecture is all naturally inspired and blends in to the surroundings. 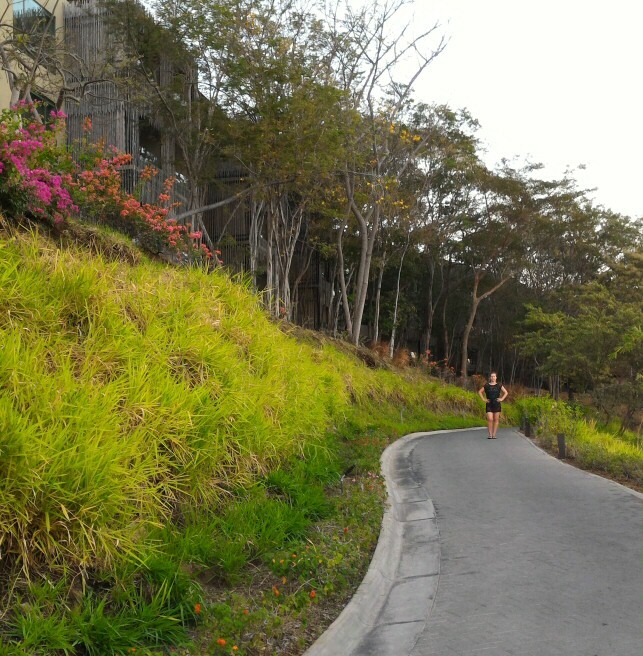 The resort is located on a steep slope and is positioned lengthwise so that most of the walking is across the slope. Even so, you will definitely stretch your calves at the Andaz Papagayo; ramps and stairways are needed to access most locations. Cross-slope pathways connect different parts of the resort. Guanacaste is on the dry, Pacific side of Costa Rica. The weather is heavily dependent on the time of year. They rainy season is May-November and the rest of the year it is very dry. The vegetation is very different from the rain forest only 75 miles away. 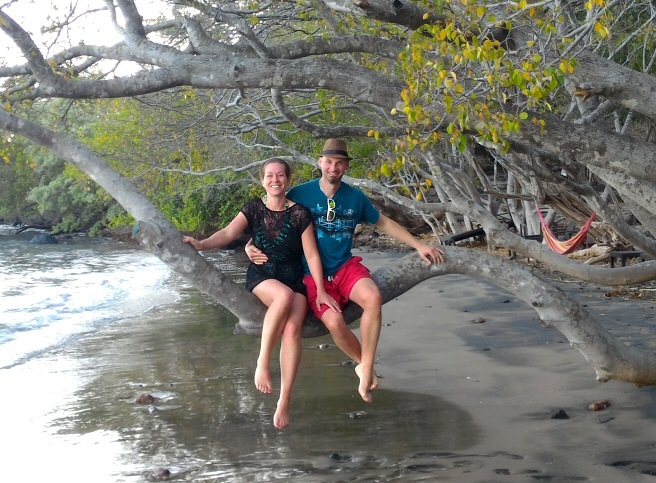 The forest on Peninsula Papagayo is classified as a “dry tropical” forest, and it becomes mostly brown during the dry season. Despite the thick forest cover everywhere we looked, we saw more cacti than palms! Click here to learn more about the climate in Guanacaste. We booked 2 nights with our anniversary free nights from our Chase Hyatt cards, and one night with Hyatt Gold Passport points (15,000 pts). Anniversary free nights and award stays can only book into the standard room, called the “Andaz Double” or the “Andaz King” depending on the bed configuration. We got an Andaz King in building 7. I was a bit disappointed we didn’t get one of the many rooms with views of the bay I had seen in reviews. Our room looked out into the forest and we could just barely see the ocean through the trees. As our stay progressed I came to realize my disappointment was undeserved. Yes, the view would have been nice, but our room had two advantages the higher up buildings and rooms didn’t have. One advantage was the monkeys! 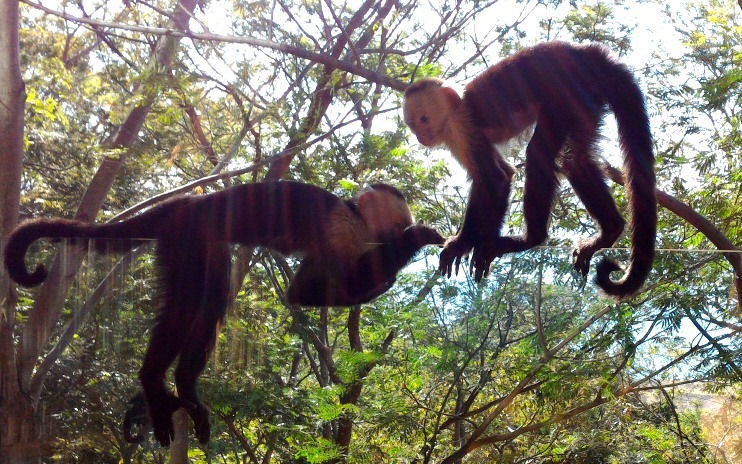 We got very close and personal with the white-faced monkeys that roamed the property. The rooms with balconies above the forest canopy didn’t have our front row seats for the monkey show. The second advantage to our “no view” room was the privacy. In three days I didn’t see a single soul from our balcony or bay window. By the end of the stay I was comfortable changing into my swim trunks anywhere in the room. It also allowed us to fully utilize the walk-through open air shower without fear of being creeped upon. 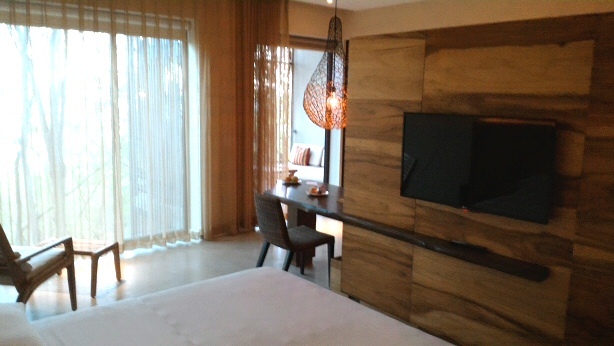 The rooms at the Andaz Papagayo have a very contemporary, clean design and utilize native wood in the cabinets and other decor. The shower with vanity and toilet closet behind. Photo was taken from the balcony. Our one complaint about the bathroom was the toilet closet. The frosted glass door between the toilet room and the main bathroom area doesn’t seal at the top, bottom, or side. And the frosted glass doesn’t provide adequate privacy. As my long time readers may know, I’m a sucker for sleek design and aesthetics. But there are some cases where function needs to trump design. The poor planning on the toilet enclosure is one of those cases. 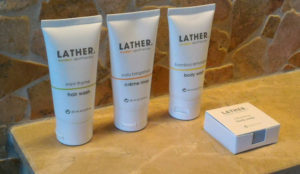 The quality of the soap, shampoo, and body wash was a nice surprise. The shampoo was some sort of tingly minty stuff, and the body wash smelled like an entire citrus grove smashed into a tiny bottle. Like the Andaz Maui where we stayed for free in September, there was a small bonus amenity kit on the bathroom vanity with q-tips, make-up remover, and other such things. Speaking of small bonus surprises, when we arrived there was a hand-written, personalized note on the desk welcoming us to the Andaz. There was also a plate with three fresh oranges and another plate with biscotti and Nutella. In my book, those little extra touches are definitely worth the resort’s cost, as they make guests feel that much more welcome and special. Our king bed. The hats (and flip flops – not pictured) were ours to keep. 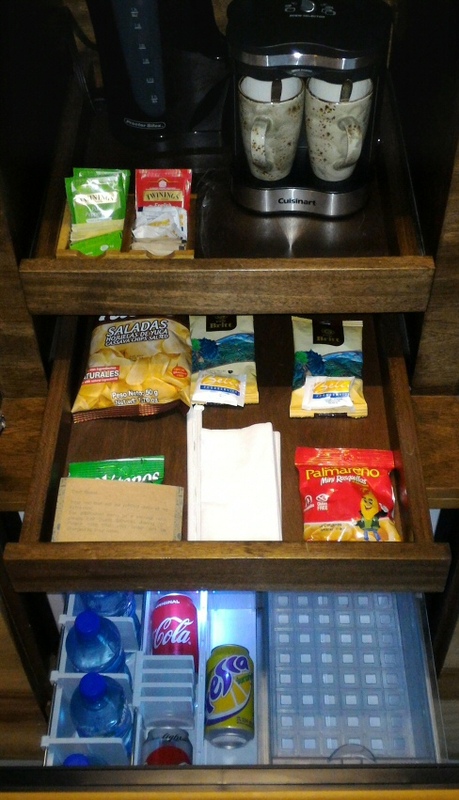 That snack cupboard with the broken light switch is one of the trademarks of the Andaz brand. Well . . . the complimentary snacks; not the broken light. Every day the cupboard is refilled with coffee, several kinds of chips, Diet Coke, Coke, Fresca (a citrus soft drink – not the early 90s American Fresca), and bottled water. Like the Andaz Maui, this fridge is not a true fridge, but a cooling cabinet. Drinks get cold but it takes a long time. Unlike the Andaz Maui, this “fridge” was actually large enough to store some of our own drinks. The clock/alarm/stereo also came in handy. The little unit actually had really good sound with the “Mega Super Bass Enhancer” (or whatever it was called) turned on. 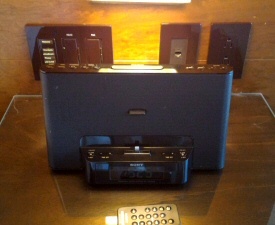 It has an iPod dock but can also be used with any 1/8″ headphone jack device (bring your own patch cord). While I’m on the subject of cords, I’ll also mention that the TV has VGA and HDMI inputs, but again: bring your own cord. Overall the room was awesome. We used every feature of the room: the small table and lounge chair overlooking the bay window, the closets, both balcony doors, the balcony furniture, and the desk. The shower was wonderful and besides the complaint about the toilet closet, the bathroom was functional and convenient. Room service was wonderful. 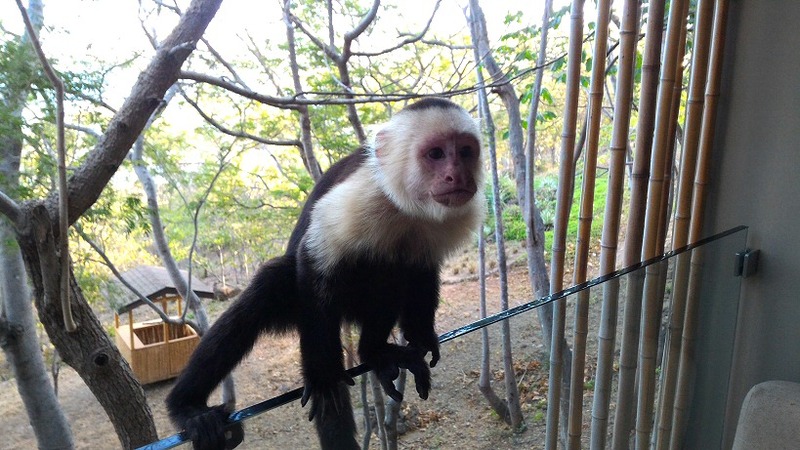 Despite the lack of an ocean view, the monkeys and their antics made us very happy with our room location! Non-award bookings at the Andaz Papagayo Peninsula pay a resort fee which seems to fluctuate with the price of the room. A few sample bookings on the website just brought up nightly resort fees of $37-75, depending on the time of year. The fees cover use of all the facilities (this should actually be considered part of the room rate) and the included beach activities. Award bookings and free nights have the resort fee waived. Aside from the food and drinks, it feels a bit like an all-inclusive resort. Most of the beach activities are included with the resort fee. At all the pool areas there are towel stands with complimentary fruit-infused ice water and 3 different types of sunscreen. We ended up with some sunburn despite frequently re-applying copious amounts of sunscreen from these stations. There’s a reason why all the locals wear long sleeved shirts and shaded hats; the Costa Rica sun is strong! The zero entry pool in the kid-friendly area. Click photo to see a larger version. I am in love with the Andaz vision for swimming pools! 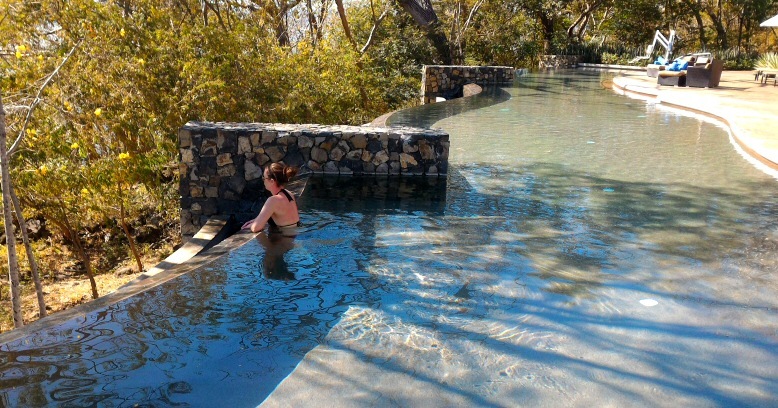 Like those at Andaz Maui, the pools at Andaz Papagayo are incredibly beautiful. They contribute equally to both the beauty of the resort and to the potential for tropical relaxation. Andaz Papagayo has two main pool areas. One is a family-friendly pool complex (pictured above) and the other is a single infinity pool in another area, for adults only. The family-friendly area consists of a smaller pool on the highest terrace, with a larger zero-entry pool below it. Another pool is around the corner, directly under Rio Bhongo restaurant. The adults-only area contains a single swimming pool and is located under Ostra restaurant, at the far end of the resort from our room. We didn’t swim in this pool until our last morning. The distance from our room and the lack of obnoxious kids at the family-friendly pool area gave us little reason to swim here. During our stay there were a few little kids in the family-friendly area, but it certainly wasn’t overrun. We spent most of our time in that area since it was right next to the building with our room. All swimming pools have infinity edges. None are heated, from what we could tell. The signage says the pools close at 9:00 p.m. but upon checking in, our host told us they were open 24/7. Major points for having 24 hour pools! We were however disappointed to find out there is no hot tub on the property. It would have been the perfect place to hang out in the cooler evenings and meet fellow travelers. In fact, the lack of a hot tub was our biggest single complaint about the property. Prior to our trip I read multiple reviews decrying the lack of a good beach. Knowing this ahead of time helped us avoid disappointment, but I have to agree with those reviews. The two beaches at the Andaz Papagayo are small (virtually nonexistent during high tide) and the ocean floor is far from pure sand. On top of that, the water was as cold as a Minnesota lake! This is as close as we came to swimming in the bay. However, what the beach lacks in swimming potential it makes up for in interesting flora and fauna. We found tons of little hermit crabs on the sand and on the rocks. During low tide the beach, which is a beautiful blend of tan and black sand, is littered with shells. From the beach we got a good look at many types of lizards, including some 3-4 foot long iguanas. They would scurry up into the woods a second before we would get close enough for a good photo! As a forester, I was interested in the hundreds of different tree species in Costa Rica. We signed up for a snorkeling tour the first morning of our trip. When we got to the meeting place on the beach, the guide told us she had to cancel the tour because the bay was full of jellyfish. No arguments here! She told us they might be out to sea by early afternoon, but that the wind might be a problem. The danger was getting blown into shore where the rocks are covered with spiny urchins. There were also sharks to watch out for, and tiger eels, and poisonous sting rays, and occasionally deadly sea snakes. . . We decided to sign up for a kayak tour instead, and see the sea life from above the water! The kayaking tour was pretty fun. They use plastic 2-person kayaks and the tour moves at a leisurely pace. I told Nicoleen not to paddle and I don’t even think I broke a sweat. The tour goes south along the coast and then back. We saw puffer fish, a blue heron, an osprey, and several other kids of fish. 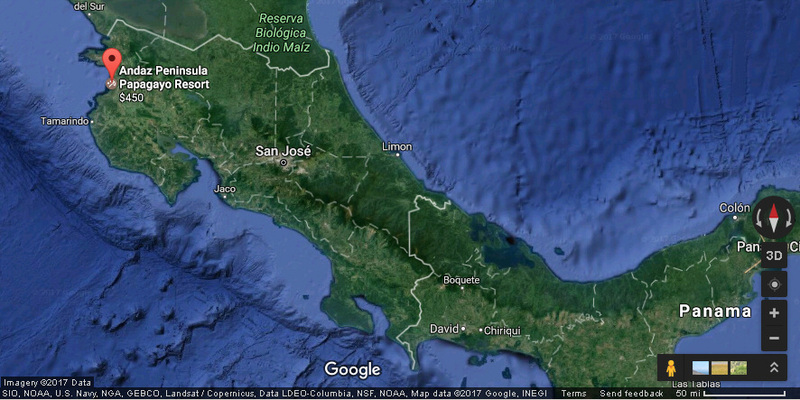 The guide talked about the peninsula and Costa Rica in general, focusing on the climate and biology of the area. Stand up paddle-boarding was also an option and there was some sports equipment on the beach during low tide. Wave runners were also available for rent: $75 for 30 minutes or $150 for an hour. We considered renting one but decided to get in some more swimming pool time instead. Neither of us used the fitness center or the spa, so I can’t comment on them. The resort sits in a fairly remote location on the Peninsula Papagayo. Therefore, guests are pretty much forced to eat at the on-site restaurants. I call this kind of situation “hostage dining.” There are restaurants at the nearby marina and beach club, but online reports indicate they are similar in price to the Andaz restaurants, with slightly less food quality. I can’t imagine a scenario where resort guests didn’t eat at least some of their meals at the on-property restaurants. Rio Bhongo is open for breakfast, lunch, and dinner. Chao Pescao is open for dinner, tapas menu, bar is open late. Having known about the hostage dining situation before the trip, we packed a carry-on sized suitcase with snacks, pop, and booze. I used to make fun of people who brought their own food on vacation, but we didn’t do it to avoid local or cultural foods. We did it to avoid $15 drinks and $100 restaurant breakfasts. It did feel a bit lame though, but it did save us a lot of money and more importantly: time. Quick breakfasts in the room meant more time to relax by the pool! All that being said, we did end up having some meals at Rio Bhongo, so this review will cover the food and service at that restaurant only. The restaurant is next to the kid-friendly pool area and gift shop. Like all of the public areas at the resort, the building is open and airy. Our first night at the Andaz we had a light supper. 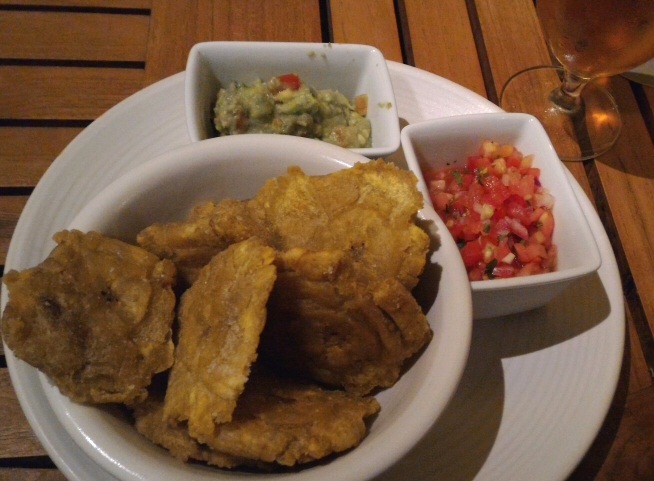 Nicoleen had pasta and I got the patacones (fried plantain) appetizer. We were both slightly underwhelmed by the food but I was pleased with my first taste of the Costa Rican beer they served. The fried plantains should have been crispy, but they were tough. Rio Bhongo also services the pool area during the day. 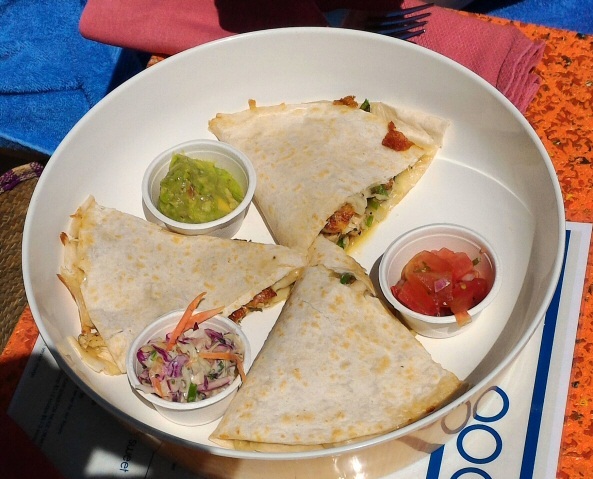 Our second day we split a poolside chicken quesadilla. (I don’t mean to say it was made with poolside chicken; I mean it was served to us when we were by the pool.) The quesadilla was enough for both of us. It was served with the same awesome fresh pico and guacamole I had the night before with my patacones. The quesadilla was above average. But having food delivered right to your face while drinking beer and sitting on a lounge chair by a scenic swimming pool is what really made the small lunch worth the ~$20 charge. The third and last time we ate at Rio Bhongo was for dinner. I had been craving seafood and Nicoleen wasn’t up to the octopus I had been eying on the Chao Pescao menu. 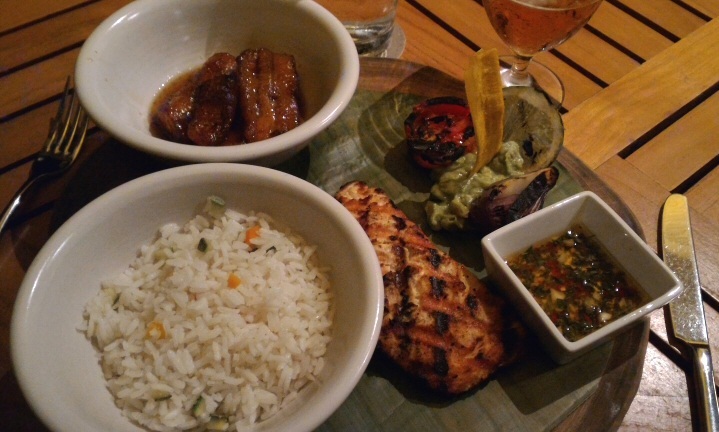 So we returned to Rio Bhongo to discover it was “special grill night.” Two of four selected sides were included with any grilled entree. I got the salmon and Nicoleen got the steak. It was probably the best grilled salmon I’ve ever had. The rice and plantains in maple honey were wonderful as well. In Costa Rica I learned that good pico and guac go with almost anything. Our only dining regret was not checking out the bar at Chao Pescao on our first night, when we heard the live music from our balcony. Without a hot tub on the property, the live music and evening bar crowd seem to be the only after-dark opportunity for socializing. When we planned this trip in late November (3 months prior to traveling) the published rate for our room averaged $405 per night. After adding the resort fee and taxes, the total cash value for our 3 night stay was $1,541.32. By using anniversary free nights from our Chase Hyatt cards (full review of this card coming soon!) 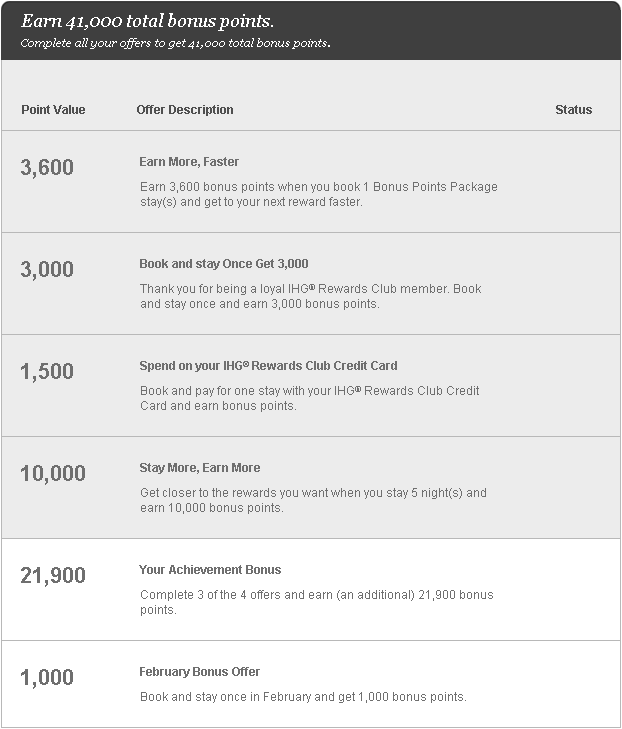 for the first two nights and booking the third night with Hyatt Gold Passport points, we paid $0.00! If you want to include the 2x $75 annual fees we paid on our Hyatt cards to get the anniversary nights, you could say it cost us $150 for a $1,541 stay. Not bad at all! 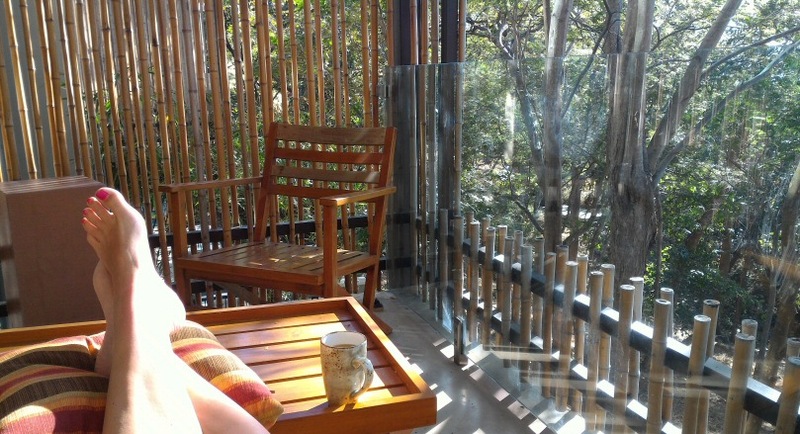 Rooms at the Andaz Peninsula Papagayo cost 15,000 Hyatt Gold Passport points. This category 4 resort is a definite sweet spot in their redemption table. In contrast, the comparable Andaz Maui at Wailea costs 25,000 per night. The Andaz Papagayo is also relatively easy to book with points. There are minimum stay requirements on some dates, but they are far less restrictive than some other Hyatt properties. With only a three month notice, I was able to find three nights in a row during a peak season. Each night I searched was individually available for a points or free night redemption. No minimum stay requirement blocked my search. Hyatt Gold Passport is a 1:1 instant transfer partner of Chase Ultimate Rewards. You can get 59,000 Ultimate Rewards with the sign up bonus on the Chase Sapphire Preferred. 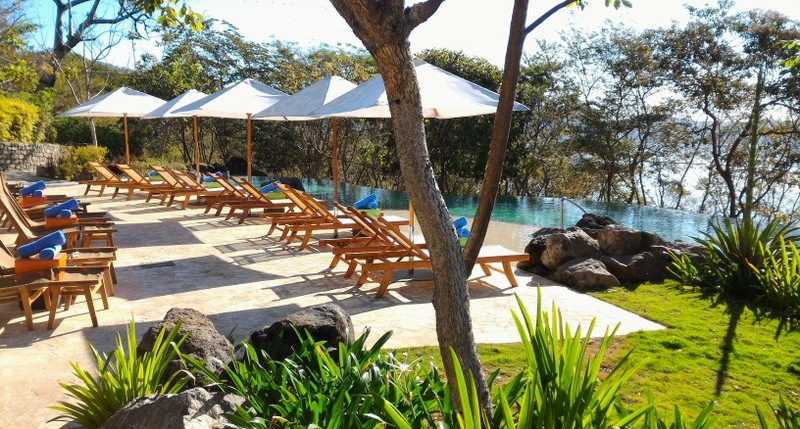 That’s almost enough for 4 free nights at the Andaz Peninsula Papagayo! Click Here for my review of the Sapphire Preferred and a link to the application page. I am very confident this was a worthwhile use of our Chase Hyatt annual free nights. The value of paying the $75 annual fee to get the annual free night is likewise a pretty easy case to make, considering one night here would normally cost over $500. For 15,000 Hyatt points it’s also a steal. A points redemption at the Andaz Papagayo puts Hyatt Gold Passport points at around 3.3 cents each; higher than most commonly assigned values for these points. 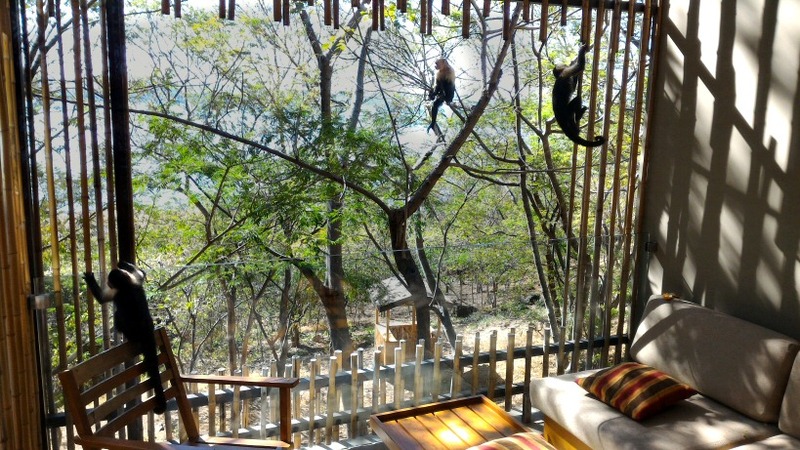 Whether or not a stay at the Andaz Peninsula Papagayo is worth the published cash prices is not for me to say. It’s largely up to your personal finances and travel budget. However, I hope this review helps to inform your opinion on how valuable staying here would be for you! This was our second stay at an Andaz brand resort and we continue to be impressed. Hyatt has really nailed their goal of creating a chic, luxury, boutique experience with this chain. Overall we received excellent customer service. The grounds and facilities are as amazing in person as they look in the photos. The brown vegetation. As you can see from my photos, it’s a beautiful landscape but don’t expect many palm trees. The low humidity. Relative humidity percentages dropped to the 40s and 50s during the day. Nighttime recovery was barely into the 80s. Despite walking up steep hills in the heat and paddling for two on the kayak tour, I think I barely broke a sweat the entire time. The bay view. The resort is located in Culebra Bay so you can’t see the horizon on the open ocean. Instead, you get what could be described as a lake view. 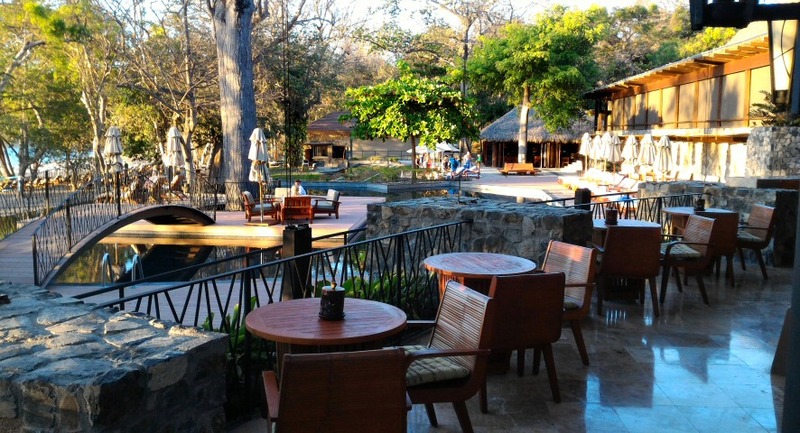 Although we visited during the dry season and much of the natural vegetation was brown, the resort landscaping did a good job creating a lush atmosphere. Around the resort there are lots of planted trees, shrubs, hedges, and flowers. This landscaping is irrigated so it stays green all year round. The builders must have taken great care to protect the existing vegetation. The resort is only three years old but the mature forest comes right to the edge of many buildings. During our stay the guest demographics were pretty varied. There were couples in all age groups and a few families with small children. Over half the guests seemed to be American, but we encountered people from Costa Rica, Germany, and Russia as well. This was in sharp contrast to the guests we met at the Andaz Maui at Wailea, who were almost invariably affluent, 20-somethings from either L.A. or New York. The Andaz Papagayo seems to attract laid back travelers of all ages and, of course, fellow points and miles aficionados! There is no hot tub on the premises. Don’t expect one! There aren’t any publicly accessible ice makers. We called the front desk to have ice delivered and it never came. If you need ice, the bartenders by the kid-friendly pool will fill up any container you bring them. 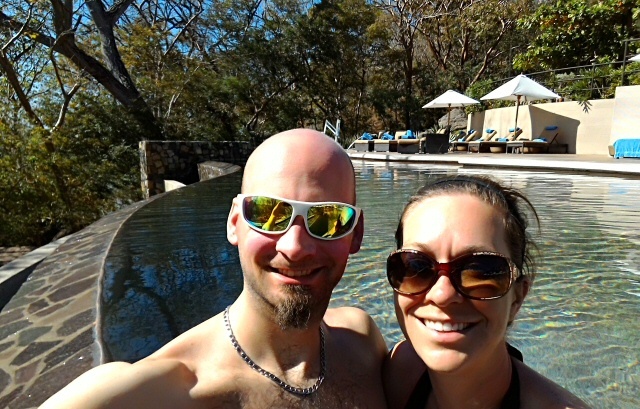 The sun in Guanacaste is not like the sun in Florida or Southern California. At 10 degrees north latitude it’s very strong. Apply more sunscreen than you think you need! If you’re on any sort of budget, don’t hesitate to bring some of your own food and alcohol. It seems like a common thing to do at this resort. All restaurant and bar prices will have a 13% tax and a 10% service charge added to them. We never figured out if the service charge was supposed to cover the tip, so we added a tip anyways. If anyone knows the standard tipping customs in Costa Rica, please explain it in the comments. The whole beach basically vanishes at high tide, so mind the tide chart provided at check-in when planning beach activities. Scenery, prices, wildlife, and weather all vary a lot depending on the time of year. Plan accordingly. 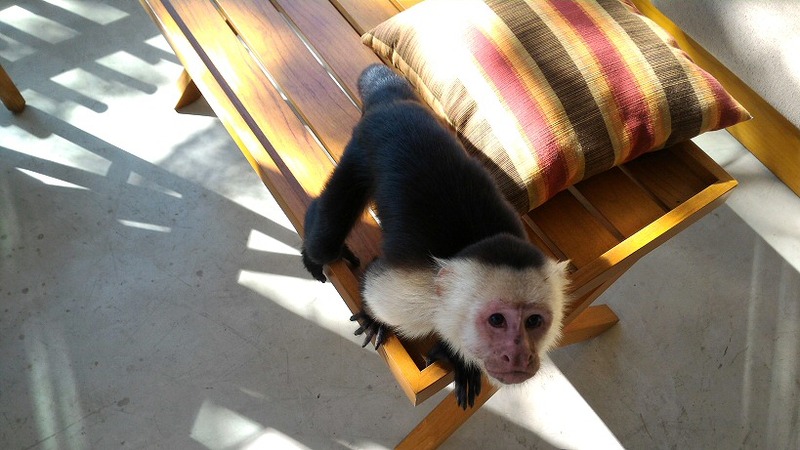 Anything left on your balcony is subject to search and seizure by monkeys! Thankfully we realized this without learning the hard way. Have a back-up plan if you’re signed up for any activities involving the ocean. Weather and sea life conditions may cancel your plans. This entry was posted in Hotel Reviews, Hyatt, Trip Reports and tagged Andaz, Costa Rica on February 23, 2017 by Gomanson. Vacation hang-over is definitely at full strength here. We returned from Costa Rica on Tuesday night and Wednesday morning it was back to reality. I’ve found the best cure for the vacation hangover is to start planning the next free vacation! So that’s just what I’ve been working on this week. A full review of our Costa Rica trip and the Andaz Papagayo will be posted within the week. Flying from Liberia, Costa Rica, to Houston, we got one last look at Culebra Bay and the Papagayo Peninsula. – Costa Rica Field Report was my one and only post written on our recent vacation. More reports on this trip are coming soon! – Review – Couples Negril Resort Activities is the final report and review of our Jamaican vacation from almost 2 years ago. It was the last major trip we actually paid for, before our points and miles accounts really got going. 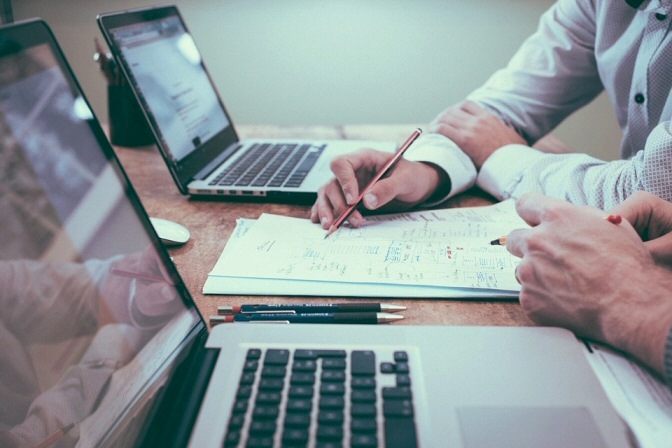 Intercontinental Hotel Group (IHG) is running one of their popular “Accelerate Promotions.” Each IHG Rewards member gets a customized list of bonuses they can earn during the promotional period. These are typically worth doing if you are planning some hotel stays in the near future anyway. IHG includes some less expensive chains like Holiday Inn and Staybridge Suites. I’ve read reports of people booking a random night at a cheap hotel in order to earn points worth far more than the hotel stay cost them. To read more about this promotion check out recent blog posts by Frugal Travel Guy and One Mile at a Time. My personalized offer this time around. There’s no block buster new cards or elevated sign-up bonuses to speak of at the moment. Chase’s 5/24 rule continues to limit many people’s possibilities as far as good sign-ups go. I plan on writing a beginner’s guide some time soon, which will address how Chase’s and other banks’ rules for sign-up bonuses should factor into your card strategy. Nicoleen is still working on her Chase Sapphire Reserve sign-up bonus spending. I can wait to see that 100k UR points appear in her account! Now you’re updated. Go employ some Value Tactics! This entry was posted in IHG, Weekly Updates and tagged Costa Rica on February 20, 2017 by Gomanson. I didn’t want to take the time to write a field report on this short trip, but United Airlines just graciously gave me some extra time at the airport. It’s the last day of our trip, and a last minute delay pushed our flight to Houston back by almost 2 hours. This might end our hopes of visiting the KLM lounge at IAH (Houston) during our now brief layover. 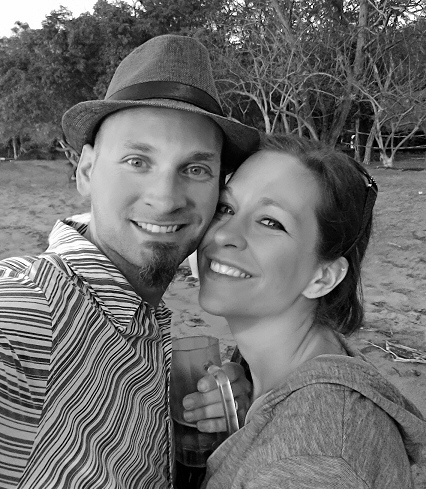 We spent most of our short time in Costa Rica at the resort. Overall it met our expectations, which were high. A couple of details disappointed us, but others happily surprised us. I will do a full review of the Andaz Papagayo in the coming weeks. Morning sun on the zero entry pool at the Andaz Papagayo in Guanacaste, Costa Rica..
That’s all I have to write for this little field report. I need to get back to sitting here, staring at the wall, pondering what kinds of tasty free foods and drinks we’re going to miss out on if we don’t have time to visit the KLM lounge in Houston. This entry was posted in Hyatt, Trip Reports and tagged Andaz, Costa Rica on February 14, 2017 by Gomanson.